Whether you’re a professional chef, culinary enthusiast or someone who loves preparing great food, with passion comes greatness. If you want to rediscover your passion or if you're using a dull hand-me-down chefs knife, or your sub-par knife set isn't cutting it anymore, it's probably time for an upgrade. Likewise, if your once-perfect knife has been used and abused and won't hold it's edge, perhaps it's time to rediscover your passion for food and be great. Fortunately there's Hanzo, the perfect knife that brings out your passion. What's great about the Hanzo Katana. Pure passion! Our blades are made from premium high carbon stainless steel that’s razor sharp, won't rust and stays sharp 4x longer. No more worries about your knife going dull quickly, which is a major problem with many low knives. If you’re looking for a knife that keeps an edge and is comfortable to hold, Hanzo is the right choice. All with a stunning look. Hanzo Katana knives are specially designed with you, the passionate chef. Feel how comfortable the custom handle is to hold when you start cutting. Clean and easy cuts, every time.The Hanzo chefs knife performs in your restaurant kitchen or at home. Perfect for all beef, fish, chicken, pork, game meats, vegetables and fruits. Unlike dull, regular chefs knifes, we custom designed the Hanzo Katana knife to look and function better than any other knife. It is shaped to make food preparation a breeze, with an ergonomically designed custom grip that feels like a natural extension of your hand and a precision blade that cuts like a laser. It is both stylish and fun to use, and each knife comes in a FREE Gift Box for a great present! More time for creativity and less time spent sharpening with the Hanzo Katana edge. A thinner but tough blade lets you make smoother cuts through butternut squash and carrots. 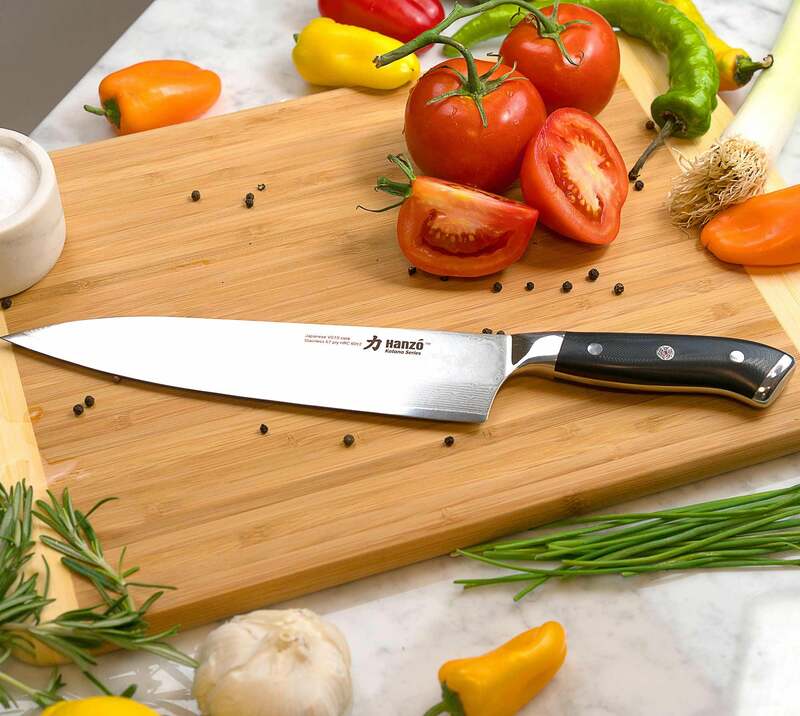 The 4x edge retention and superior steel lets you focus more on creativity, cutting, slicing and dicing rather than on sharpening and maintenance. With our custom handle shape you will perform for longer with less hand strain. Our continuous contour handle is perfect for chefs with demanding work schedules. With a polished bolster and natural feel, our handles will help you perform at your peak. All with style and looks. An overview of the Hanzo Katana from tip to bolster. Hanzo Katana gives you the features to perform in the kitchen. It's the perfect knife for chefs seeking to improve their technique and skill. Whether you're working with proteins, vegetables or fruit, Hanzo Katana provides the features you need to produce outstanding results. All without needing to worry about excessive edge maintenance. Our superior Japanese VG10 steel helps us attain 4x edge retention over other knives. Our special heat and cryogenic treatment achieves a steel hardness of 60 Rockwell and our high carbon and chrome content provide razor sharpness without staining or rusting. 67 ply steel ensures strength and firm positive cutting action. 600 years of Japanese steel making technology. Our custom handle has lines and shapes that support your hand whatever your working style. The continuous flow under the handle reduces wrist strain and finger strain, even in the most demanding conditions. No twisting, slipping or flexing. Our full tang forged handle and blade feels firm, positive and responsive. To protect you from injury and accidental nicks, we've added a rounded heel to protect your fingers from extra sharp edges.